Distinguishing unilateral from bilateral forms of primary aldosteronism is crucial for the correct treatment strategy. 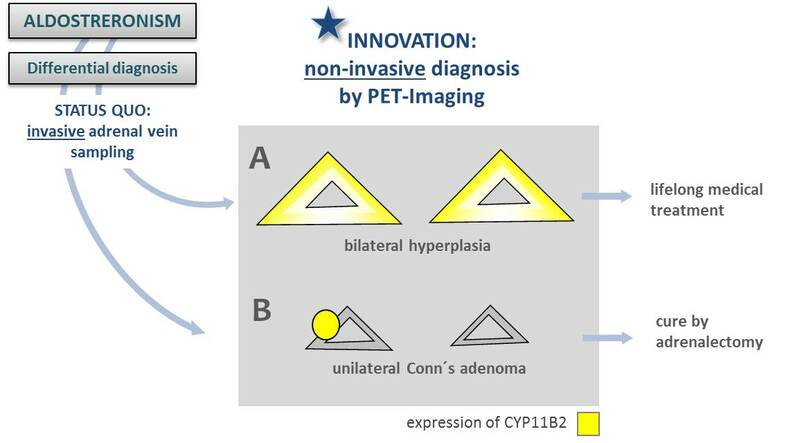 While primary aldosteronism based on a unilateral condition (Conn adenoma) may be successfully treated by surgery, bilateral hyperplasia is treated conservatively by medication. However, the so far performed diagnostic adrenal vein sampling in combination with cross-sectional imaging, is an invasive and technically challenging procedure with frequently inconclusive or unreliable results. 11C-metomidate (MTO)-positron emission tomography was reported as a potential replacement for adrenal vein sampling. However, MTO has low selectivity for CYP11B2 (aldosterone synthase) over CYP11B1 (11ß-hydroxylase). Both enzymes share a 95% nucleotide homology, however CYP11B1 is not suitable as a differentiation marker. Consequently alternative strategies for distinguishing unilateral from bilateral adrenal diseases are demanded. Primary aldosteronism is a common disease with an estimated prevalence of 1.5% to 3.5% in Europe. The novel, non-invasive diagnostic method for differentiation between unilateral and bilateral aldosteronism has many advantages compared to the conventional diagnostic options. Inherent risks of the adrenal vein sampling, like internal bleedings can be completely avoided. Another drawback of adrenal vein sampling is the extremely high radiation exposure of the patient, which could be significantly reduced by PET imaging. Furthermore the enhanced specificity and sensitivity of the PET-imaging with the reduced risks for the patients leads to the prognosis that the number of conducted diagnostic investigations will increase. The easy synthesis of the PET-tracers further strengthens their potential to replace the conventional diagnostic methods.